All TVs upgraded to LED HD living room 50 inch, All bedrooms with 32 inch. Keywords: House with Pool/Spa on Pond! We as a family are excited to own a home in the Orlando, FL area, the world's #1 tour destination where we can get away to the warm weather ourselves. We chose Emerald Island because it is like a vacation resort with the beautiful gated entryway and all the amenities it has to offer. Our backyard is on a private conservation/pond area. We love to see the different birds of Florida especially the large Sandcranes along the pond. Property backs up to a pond with no rear neighbors! Watch the ducks and the birds. There are three cranes that will often come up to the pool. Wifi is available in the clubhouse which is a very short walk from this pool home. The signal may work inside the home. Dine on the deck watching beautiful sunsets. After dinner hear and watch the Disney firewors in the distance. We loved the house. It was everything we were looking for. Hopefully we will be able to return next year. Thank you for your review. We look forward to serving you in the future. 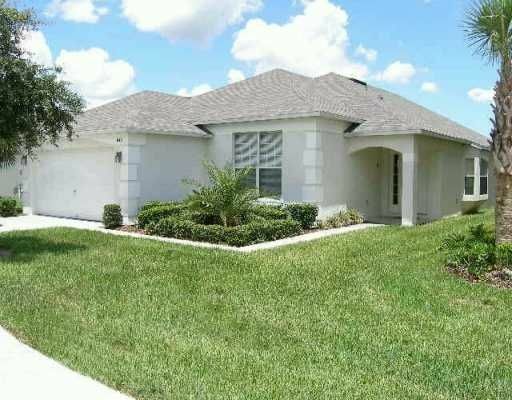 Property had all we required for our stay,emerald island is our preferred location in Kissimmee,pool view over lake and conservation area is excellent and the Location is a real 20 or less to Disney. Thank you for taking the time. Your feedback is appreciated. Great property for our vacation! We had a great 10-day stay at this property! The owner & rental agency took the extra step to guarantee our stay was top notch. The two master suites accommodated our family. We would highly recommend this property & will book for our future stays! Beautiful clean home with great water views in the back - no homes behind. Awesome location, close to all attractions and shopping needs. Quiet gated community and friendly staff. We all enjoyed the heated pool and spa on our days off from the parks! We hope to be back real soon!!! Go Eagles!!! Thank you very much. I strive to do the best for my guests. Great location and a great stay! The Villa is right next door to the Clubhouse which is a huge selling point, ensuring that we could easily stagger (Tiki Bar was open on Christmas Day) back and forth. The property was plenty big enough for the 7 of us who were using it with a lovely warm pool to keep us occupied when we stayed in. Emerald Island is a perfect location for visiting the main attractions and is only a stone's throw from the 192. Maybe needs a little TLC, but anyone using it as a base for parks etc. wouldn't bat an eyelid. Would stay again - what more can you ask. Thank you for your review .I appreciate you taking the time. 24-Hour Gated Security, Concierge Services, 2 heated community pools, Whirlpool, Fitness Ctr, Sauna, Video Arcade, Cyber Cafe & wireless hot spot, Tennis Center & equipment loan, Basketball half courts, Poolside tiki bar, 2 Playgrounds, Volleyball Sand Court, Nature Walk, Meeting Room, 5-a-side soccer, Clubhouse w/large screen cable TV, Sundry Items, Special activities & events.